This rugby games glossary is divided into 3 parts that includes an introduction and a learning games section for new rugby players and fans. Rugby Games Glossary is dedicated to passionate game players and fans that compete, watch this favorite of sport games and cheer rugby gamerisms.Rugby is a sport that has translated well in many countries and its global popularity is evident. At gamerisms, we were searching for a 10th game to add to the sports section. Our standards were that the game had to be popular worldwide with players and fans that are keen and supportive of the game. During our research, we found all that with rugby plus an understanding of the mindset of supporters. They prefer not to be compared to US football or any other sport, but rather let the unique game of rugby stand on its own—as it deserves! The result is what we at gamerisms believe to be one of the most comprehensive rugby glossaries on the web--so to all passionate rugby players and fans—enjoy your game! There are 2 types of rugby games and both are covered extensively in this rugby games glossary. The first type is Union Rugby and is the most common game played, while the second type is League Rugby. The primary differences between the two types are the number of players per team, scoring points and the end-result of a tackle. There is a detailed comparison chart below. The history of the game is based on several variations of football played at Rugby School and various English public schools in the nineteenth century. Between the mid eighteenth century and mid-nineteenth century, the rules of rugby were based on local agreements. For instance, the ball could not be run forward at all. Handling the ball with the player's hands was allowed, but they could not move forward with it. Eventually this changed at some point between 1859 and 1865. An individual named William Webb Ellis is accredited with the concept of running the ball forward. Rugby games have several different rules according to which version is played. The primary rules that are similar are movement rules and how points are scored. In rugby, the ball can be run or kicked forward, but it can only be passed laterally or backward. The teams are designated as attackers and defenders dependent upon whether they have the ball or not. The attackers have the ball. The defenders do not. Rugby games of this type are played with fifteen players per team. Players will contest possession after a tackle has occurred. Depending on how play progresses, either a ruck or a maul may occur. Union play also does not have a six-tackle rule. A team will keep the ball for an unlimited number of tackles barring the fact that they score, lose possession, or commit a form of offense. The scrum is a large part of this game type. Several opposing players will push each other trying to achieve possession. The lineout is important as well. The lineout is where parallel player lines from each team attempt to catch the ball from the touchline when it is throw. League players do not contest possession after a tackle. Play will instead continue with a play-the-ball. If the thirteen-member team does not score within six tackles, they lose possession. Scrum still exists in the league code. The importance is reduced however as it involves a fewer number of players and is rarely contested. Many league positions are the exact same as in Union rules rugby games. However, league rugby has no flankers. While the ways to score are similar for both games, the points awarded are different. The try is worth 5 points in rugby union and 4 points in rugby league. In both games, a conversion following a try is worth 2 points. A drop goal is worth 3 points in union and 1 in league. A penalty goal is worth 3 points in union and 2 points in league. If a foul is committed by the opponents during a try, the referee may award the points if it is determined that a goal would have resulted. This Rugby games glossary could not be complete without listing where the two types of games are played. The sport has caught on all across the globe and in each area; it has taken on a life and language of its own. Varied game terms are used in Australia and New Zealand vs. US and Europe. 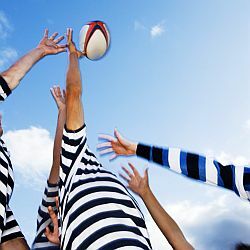 The top-tier countries in this sport for overall enthusiasm and consistent play are England, Wales, France, Scotland, Ireland, New Zealand, Australia, Argentina, Italy, and South Africa. Japan and America are noted entries in the second or third-tier countries. In some countries, such as Madagascar or Fiji, rugby games are considered the national sport. The same is true in South Africa, Wales, and New Zealand to name a few. 1) A rugby union field is a maximum of 144 meters long by 70m wide. There are 15 players per team + subs. 2) Rugby union rules dictate a right to contest possession. A team in possession is not required to surrender possession while they are able to keep the ball in play. 3) Possession remains challenged following a tackle or if a ruck or maul forms. Opponents are given a scrum if the player in possession drops the ball forward or else moves the ball forward. 5) Play does not stop when a player is down in the case of a tackle. The tackled player plays the ball and the tackler must give way at which time, a ruck is formed. 6) Rugby Games Glossary: Try: and resulting points are scored if an attacker grounds the ball before a defending player. A player that is in touch or touch-in-goal, but not the ball carrier, may score a try by grounding the ball in-goal. 7) The goal posts and padding at ground level are considered part of the in-goal area thus grounding the ball at the foot of the posts is worthy of try points. 8) Once an attacker is tackled close to the goal line and stretches to ground the ball on or over the goal line, a try is scored. 9) Once a scrum nears or crosses the goal, a player is likely to ground the ball. 1) A rugby league field is between 112 and 122 meters long by 68m wide. There are 13 players per team + subs. 2) Rugby league has a six-tackle rule. The team in possession has a set of six tackles before handing over possession. 3) Possession cannot be challenged at this point, instead play restarts with a play-the-ball or a handover. 4) League scrums are not challenged. 5) In rugby league, a play-the-ball action occurs after each tackle. 6) Rugby Games Glossary: Try: and resulting points are scored if an attacker grounds the ball at the same time as a defending player. A player that is in touch or touch-in-goal, but not the ball carrier, may not score a try by grounding the ball in-goal. 7)The goal posts and padding are not considered part of the goal line, therefore will not result in a try. 8) A player that does not reach the try-line or in-goal may not stretch out to score if a defender is in contact with them. 9) Once a scrum nears or crosses the goal, a try may not be scored in a scrum. However, when the ball is out of scrum, the player has a chance to charge through his scrum to score. 10) Conversion kick may be a place kick only. Accidentally offside: occurs when an offside player finds it's impossible to avoid contact with a challenger resulting in a scrummage for that player's team. Advantage: referee's call that allows a non-offending team to continue playing uninterrupted even after an infraction. This allows them to take advantage of the fact that their opponents broke the rules without being penalized for being innocent. It is a fair play system. How long the advantage lasts is up to a referee. All Blacks: New Zealand's national team. Ankle Tap: refers to a normally last-ditch tackle attempt. This attempt involves a diver and slapping assault to the attacker's ankle. If this is properly executed during rugby games, it will result in his legs being knocked together. This move is also known as a Tap Tackle. Back Row: consists of 2 second-row players plus a loose or lock forward to form the back row of the scrum. Backs: refers to the player group that will normally not be involved in a scrum or lineout. Usually this is number nine through fifteen. This does not include the scrumhalf. Barbarians: The name for an invitational rugby team. The most famous of them is based in the UK. They draw upon the finest players throughout the globe and bring them together with the goal of playing matches against international teams. They are also known as Baa Baas. Binding: is a critical skill for safe playing. In rugby games, this is the method for grasping and gripping opposing players during a scrum, maul, and ruck. Bledisloe Cup: title of the yearly competition that occurs between the Australian and New Zealand teams. Blindside: term for the weak side of the field. This is the short side of the rugby field in comparison to where a set piece, maul or ruck, is happening. With Rugby.the games glossary is extensive with 3 parts, an Introduction, learning games section for new players and fans plus plenty of terms, lingo and jargon--the language of the game.